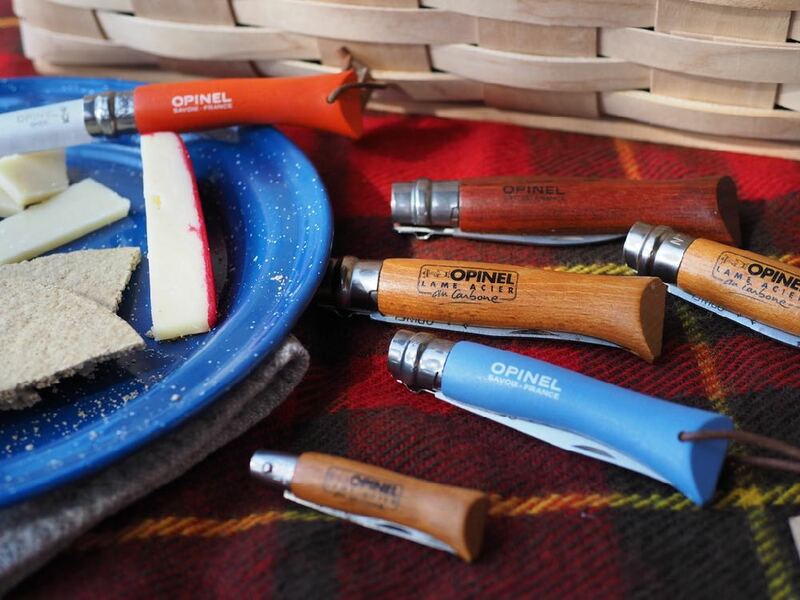 The French Opinel knife: A great picnic companion and terrific for general purpose use around the house or campsite. The classic French Opinel folding knife is a quintessential Invaluablist object: No plastic, no enhancements, no nonsense. The wooden handle feels great in the hand. The blade, once unfolded and locked, is a little bit menacing, but very effective for cutting apples, salami, cheese and other picnic staples. These knives work great for other general purpose cutting challenges too. It would be difficult to develop a more elemental folding knife format. For that reason alone, it is an Invaluablist favorite. Like almost every other classic product, it seems, the basic Opinel knife design has been "improved" and "enhanced", with many line extensions introduced in recent years. But for lovers of enduring simplicity, the basic Opinel format should doubtless be the first consideration. Thankfully, the basic model is produced today and readily available. The Invaluablist's Opinel knife collection. Opinel buyers should be aware of Opinel's blade material options. The blades are available in a choice of carbon steel or stainless steel. The longstanding classic choice is carbon steel. The upside of the carbon steel blade is that it is easier to sharpen than the stainless steel blade and produces exceptional cutting quality. The downside of the carbon blade option is the susceptibility to corrosion. The carbon blade will develop a patina, which some say give it its charm, but it will tarnish or rust in harsh environments. The stainless steel blade, meanwhile, provides great corrosion resistance but with the disadvantage of fussier sharpening. For gifts, I always choose stainless. For myself, I love my carbon-blade knives the best. The basic Opinel folding knife is available in a wide gamut of sizes (and colors). My preferred size is the Number 8, with blade length of 8.5 centimeters/3.35 inches. The Number 7, meanwhile, is a near equal substitute with a blade length of 8.0 centimeters/3.15 inches. Either fits well in a pocket and works well for general-purpose pocket knife duties. A multitude of other sizes—larger and smaller—are also available. The classic folding Opinel knife is a terrific gift consideration. Not only great for campers, and picnickers, any handy person would doubtless be proud to add one to his or her tool arsenal. They are useful in workshops and garden sheds, as well as stashed in glove boxes or car trunks for use when away from home. Most people would profit from owning more than just one Opinel knife.